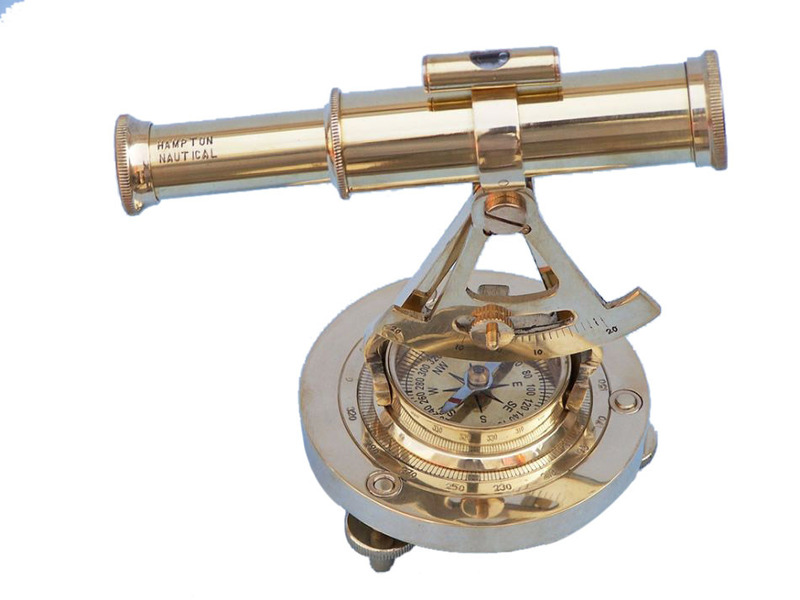 The Hampton Nautical Brass Alidade Compass with Telescope and Bubble Level is a beautiful desktop nautical gem or can rest perfectly on a mantel or bookshelf. This solid brass alidade has a 3-inch arch with 2 inch magnetic compass. Compass needle is adjustable. On the arch 6-inch fully extended telescope is mounted with bubble level. Alidade is mounted on brass metal base which has 3 adjustable screws. Nice quality reproduction for surveyors to align and measure vertical and horizontal angles. This solid brass nautical gem features a real working 8-powered telescope. Originally just a simple ruler with a sight attached at either end, the alidade came to be an important tool in nautical life. With European powers expanding across the globe from the early 15th century through the 17th century the alidade, along with the marine compass, helped map the way. During this time antique marine compasses continued to evolve, with the first liquid marine compass introduced in 1690, aiding in stabilizing the directional needle. Along with this new marine compass, which made nautical readings much easier, the alidade was used in the sighting of other ships, dangerous objects in the ocean, and finding terra firma. Whether determining a straight path, finding the angle between two points, determining star positions, or creating maps, the alidade and the marine compass were important tools aboard any ship at sea. In the 1800s the telescopic alidade was created, greatly improving its effectiveness, especially in creating coastal maps of the new world. In 1865 the United States Coast Survey used it to create a topographical map of the country, and it remains in use today from military and astronomical uses to personal uses around the house. Take advantage of this antique compass sale and discover how the telescopic alidade works for yourself.